Gemini for Mac is a quick and easy tool that allows you to free up space on your Mac by finding and removing duplicate and similar files. With it's fast and accurate scanning algorithms it cleans iTunes, Photos, and all your libraries and folders. It not only looks for exact duplicates, but also for similar files, like photos from a different angle or music in different formats. Moreover, Gemini learns which copy you choose to remove and suggests it next time. Smart Select allows duplicate removal with one click, while originals remain untouched. 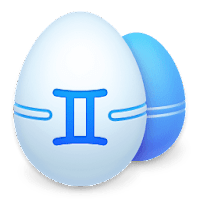 Disclaimer: Direct downloads for the lastest version of Gemini 2 for Mac 2.3.8 are provided by the official software's author, we can't guarantee safety, availability or download speed. Moreover, we don't and we won't provide any pirated/illegal versions or tools. We recommend you to avoid it as these methods can harm your device. If you like the software, buy it to support the developers. (We provide software discounts for many worldwide brands).